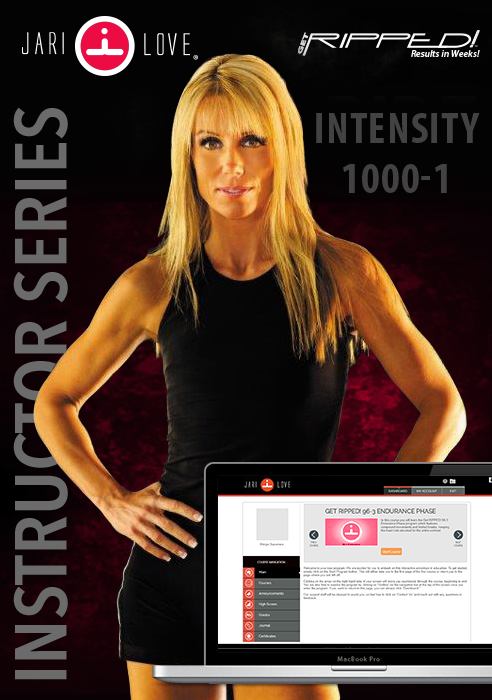 Get RIPPED!® 1000 #1 – is part of the INTENSITY phase that alternates cardio and weight tracks with simple movements and minimal rest. This workout exercises the heart and sculpts the body. The bench is an optional tool and may be used to intensify the workout. This workout moves quickly to keep the heart rate elevated. High intensity for maximum calorie burn. Short intervals keep the workout dynamic and exciting. All fitness levels are welcome as modifications are always shown. Only body weight and dumbbells are required for this workout. Everybody can feel success with these workouts. Love notes offer important tips and information to make each exercise accessible to every student, no matter what fitness level. The intensity can always be reduced for those who are working on increasing cardiovascular endurance (i.e. no or low impact) The same exercise is always repeated for 4×8 counts.